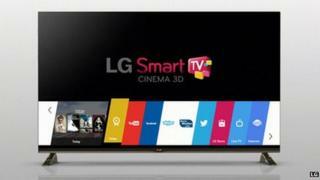 LG has shown off a "simplified" way to control and find content on its smart TVs using the webOS operating system. LG said more than 70% of its smart TVs released this year would use webOS. Analysts had complained LG's earlier menu system had been too confusing. The firm unveiled the new technology at the Consumer Electronics Show (CES) in Las Vegas, where many of its rivals are also showing off new televisions. The centre-piece of the new UI is Launcher - a scrollable menu that runs across the bottom part of the screen, allowing the owner to switch between content. Different coloured cards are used to represent on-air programmes; internet-based movies and shows from firms including Netflix and Amazon; apps including Twitter and Skype; and media stored on other devices. The idea, the company said, was to allow viewers to simultaneously watch a show, play a game or surf the internet while also searching for other content - removing the need to navigate to a home screen. A second menu bar, Today, can be activated to run horizontally across the central part of the screen providing suggestions for popular shows and other content the software believes is likely to interest the watcher. LG also highlighted that the software was designed to make it easier to set up the TV. For example, if you plug in a games console it is identified as such, rather than as an HDMI source. It also suggested it would be relatively easy for developers to create third-party apps for the platform. "One of the big problems TV manufacturers have had has been trying to tailor the available content to each user," said Edward Border, from the consultancy IHS Screen Digest. "They have struggled to crack how to avoid requiring too many clicks or menus to go through. Previous efforts to simplify things have only resulted in it becoming difficult for owners to find what they wanted." Early feedback for LG's new approach suggested it was an improvement on its previous design, but not a huge leap forward. "It won't generate massive consumer demand for LG's TVs," wrote Dieter Bohn for the Verge news site, which had an early hands-on with the technology. "But what it could do is make your next smart TV a little less painful to use." LG also used its Las Vegas press conference to announce two new pieces of wearable technology. Its Lifeband Touch is a wristband that features an OLED display, which activates when the wearer rotates their wrist. Its accelerometer and altimeter sensors allow it to display how many calories have been burned, the number of steps taken and distance covered. In addition it can tell the time and provide alerts about calls and texts sent to a Bluetooth linked mobile phone, as well as providing a way to control music played via the handset. The firm also showed off its Heart Rate Earphones, which are designed to capture data about the wearer's blood flow and oxygen consumption while exercising. LG said both devices would be released in the US before the end of June before rolling out to other markets. The firm had shown off another fitness tracking wristband at last year's CES but never put it on sale.